Life in debt, the American way. 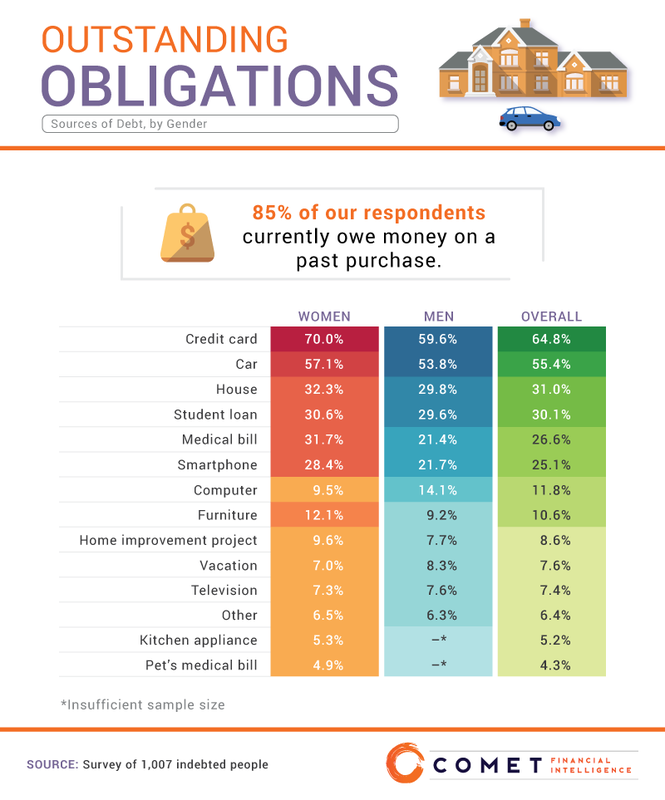 85 percent of Americans currently owe money. We come to regret at least some of that debt. Each of us needs to be thoughtful about how we finance our lives. Not accruing some kind of debt is difficult. Student loans are inevitable for many, and if you're the home-owning sort, there's probably a mortgage loan taking a chunk out of your month income. Maybe a car loan, too. Then there's credit cards, which experts say you should pay all the way down ASAP to avoid owing punishing interest: After all, that's how issuers make their money, with making the minimum payment the ultimate sucker's game — you never get to $0. Paying late is even more costly. There are also different attitudes about debt itself. The current U.S. president has proudly declared himself "the king of debt." Others aren't so sure it's a sustainable way to live. 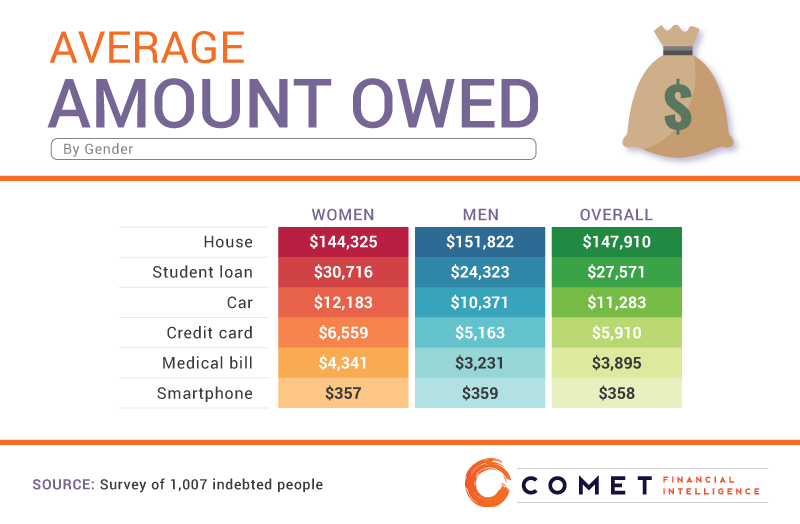 Comet Financial Intelligence was curious to know how Americans feel about their debts and conducted a survey of 1,007 people via Amazon's Mechanical Turk. Respondents ranged in age from 18 to 82, with a mean of 32, and the male/female split was roughly equal. 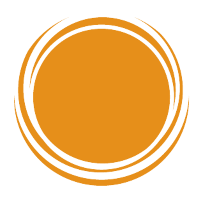 Debt Regret presents visualizations they created from their findings. All infographics in this article are from Comet. If there's one thing Americans still have in common in this fractious time, it's debt. It's how most of us live. 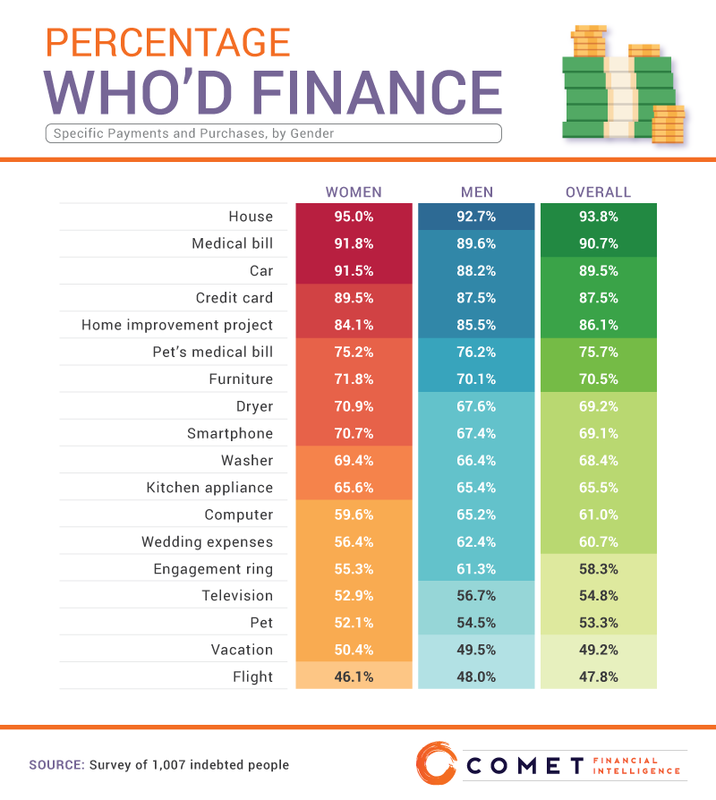 Credit cards, of course, power many of our lifestyles, and, on average, over 60 percent are in their debt — women at 70.0 percent and men 59.6 percent. Cars, homes, and student loans come next, followed by medical bills. After that, our phones. Homes are far and away the most expensive things on our tabs. And though cars are dazzlingly expensive these days, they only come in at number three — student loans, a serious problem for people not born to bucks, have them beat. For that unfeeling politician a few years back who said Americans wouldn't need government-supported healthcare if they bought cheaper phones, the survey says, "Nope." Not even close. As payments wear on ad infinitum, though, we sometimes wonder if paying that thing off over time was really the best idea. Chief among them? Student loans. (We told you it was a problem.) And then those deadly credit cards, whose debt can add up to spectacular — that is, crushing — levels when you start using one card to pay another, lather, rinse, repeat. It's a sort of payment-plan-pyramid. Homeowners are pretty chill about their mortgages, though. And we don't always have the scratch for these monthly bills when they come due. 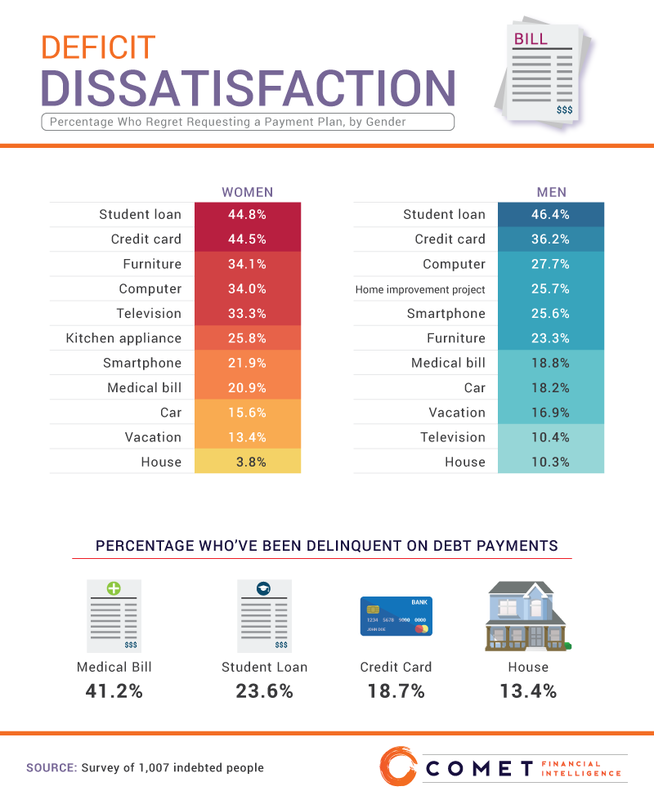 Nearly half of us, 41.2 percent, have been late paying a medical bill, and almost a quarter of us have missed a student loan payment. So, older and wiser you: What would you finance today? Of course, having the luxury to not finance something means you've got ample cash, and that doesn't describe a lot of us, especially with all we already owe. Now that your crazy youth is in your almost paid-off car's rear-view mirror, what would you consider worth the hassle now? Well, big-ticket items. A home. Medical bills, which tend to be unavoidable if not inarguable. That car. And knowing how irresistible low APRs can be, some credit cards. It's really sweet, and a sign of our growing appreciation for non-humans, that three quarters of us now consider a pet's medical bill worth borrowing for (see above). Engagement rings, those incredibly expensive baubles — the average one in 2016 was $6,163 — may no longer seem as worth impoverishing yourself and your loved one for. As we said, and unfortunately, avoiding debt altogether is probably impossible for most Americans. The best approach is to try and be as knowledgeable and thoughtful about what you're doing as you can be before making a commitment you'll have to honor over an extended period of time. Maybe you aspire to be a king of debt, too. But you certainly don't want to wind up a pauper of it.